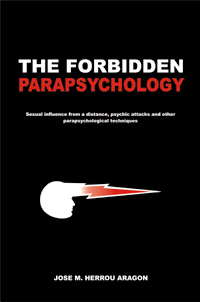 In this book the author presents for the first time impressive parapsychological techniques for influencing others on the spot. It includes techniques to attract and win the hearts of people either mentally, in their presence or from a distance, without them being able to do anything about it, as well as methods which can instantly get bothersome or harmful people away from you. The book also incorporates techniques which can protect you from parapsychological influences, help you succeed in business and mentally change all kinds of behavior, in yourself as well as in others. No special abilities are required and the results can be verified immediately. 112 páginas, 24 x 16 cm. PSYCHIC SELF-INFLUENCE. The power of our thoughts. Changing our own destiny. Different methods of psychic self-influence. My personal method of psychic self-influence. Benefits and changes produced by my method of psychic self-influence. In what situations we can use psychic self-influence. Love and business. Health and sickness. For parapsychological objectives. Lasting success in all areas of life. DIRECT INFLUENCE. Mentally influencing others is possible. Different dimensions or worlds. The power of consciously directed thoughts. How to perform direct influence. Transferring ourselves inside the mind and body of the person. Use of words and sounds. Daily practice time. Love and business. Curing illness. In all areas and aspects of life. SEXUAL INFLUENCE. What it is and how it works. How to sexually influence with success. The most important key. With the person present or not. With the person absent. The most important thing to bear in mind. Sexual arousal of the person being influenced always refers to the operator. INDIRECT INFLUENCE. What it is. Wish lists. Names and objects. Radiation of words. PSYCHIC ATTACKS. What psychic attacks are. Their nature. Natural ability to produce psychic attacks. Impact produced by psychic attacks. A universal phenomenon. Symptoms. How to carry out a direct psychic attack. The most important thing to bear in mind. How to increase the effectiveness and power of direct psychic attacKS. Other ways to apply a direct psychic attack. In what situations to use direct psychic attacks. INDIRECT ATTACKS. Wat they are. Use of photographs and names. Use of the fan. The most important thing to bear in mind. PSYCHIC SELF-DEFENSE. Traditional methods of defense and protection. My personal methods of psychic self-defense. SEXUAL TECHNIQUES. How to perform them. Orgasmic abstinence. Maithuna. The most important thing to bear in mind. The brain has to be repaired. Alone or with a partner. The first results. orbidden foods. Benefits produced by the use of sexual techniques. BREATHING TECHNIQUES. What they are. How to perform them. Quieting and retention of the breath. Applications. Benefits produced by the breathing techniques. Descargar "The Fordidden Parapsychology" versión ePub eBook. Esta versión es la indicada para ser leída en Tablets, eReaders, Ipads, smartphones, etc.